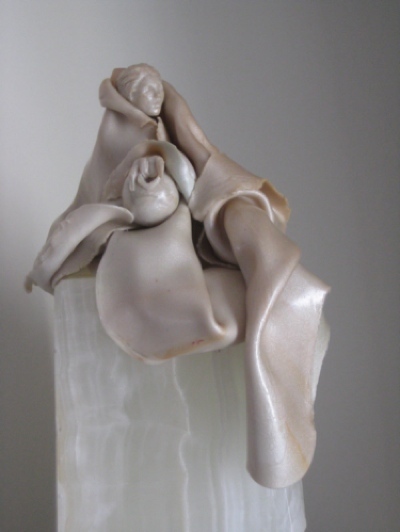 Contemporary sculptures in polymer clay and stone. Contemporary sculptures in the round communicate very differently from two-dimensional art on a gallery wall. They command a presence by their very solidity. Squarely occupying space, they force the viewer to completely engage in the art. Some artists revel in the temporary nature of 'green' materials - they aim at leaving a minimal impact on the world after their time. Everything from sand, fruit, vegetables, scraps of washed up debris on a sea shore, water and even trash is used with consummate skill for the creation of contemporary sculptures. There are technical challenges in creating a work that will be seen from all angles. 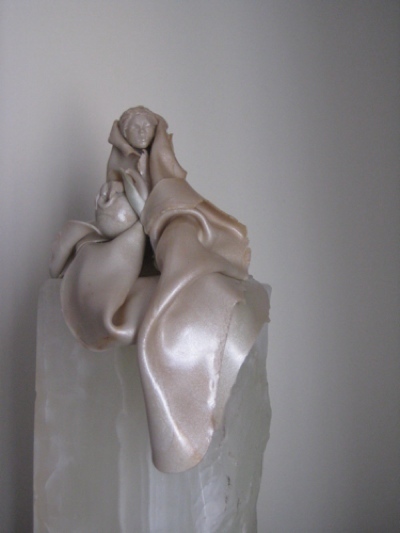 In viewing sculpture, it is important to consider more than the skill of the sculptor, the medium, or the level of craftsmanship exhibited. Contemporary sculptures are created in almost every conceivable material. Because of the current emphasis on environmental responsibility, contemporary sculptors use all sorts of materials that would never have been used in an earlier era. For some, the materials of choice are those that are man-made and commonplace, but temporary in use and value. They use DVDs, old tires, and plastic bottles… to create their works of art. These contemporary sculptors use their skills to voice concern about the impending demise of the natural world as they perceive it. I love creating contemporary sculptures because I enjoy looking for new ways of telling an old story - my favorite story, of grace, redemption and love! Longevity and durability of the work is important to me and to those who purchase my work. I combine polymer clay with natural stone or glass to create work that I hope will bless those who purchase the work for a long time to come. 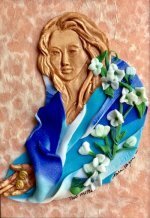 "The Water Bearer" is made of white metallic polymer clay combined with a beautiful piece of marble that has a luscious translucency and the most interesting grains. Over the years I have discovered so many scriptures on the theme of Living Water that have inspired a series of paintings, drawings and sculptures. • "If you knew the gift of God and who it is that asks you for a drink, you would have asked him and he would have given you living water. "Jn 4:10, spoken to the Samaritan woman. This is a theme that I never tire of. I see a world of precious people dying of thirst – a dry, raw thirst that they strive to quench with everything but 'living water'. Lonely, hopeless lives are filled with distractions, some happy, others not. I see a world oblivious to the passage of time and the accountability that will be required of them once their days are spent. The only advantage that I have over them is that Jesus quenched my thirst. • she has experienced the deep satisfaction of a thirst that was once raw, but is now quenched. • she has access to an unlimited supply of living water to quench the thirst of others, to whom she pours out this precious resource. 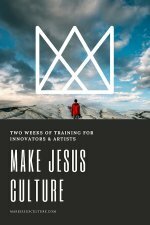 As Christian artists, we have frequently been caught in circumstances that caused us to come to the dusty, arid end of ourselves. Turning to Him, we have enjoyed being lavishly sated with living water. Jesus then strategically sends us into the lives of others, as His Water Bearers. He has given us the precious duty of being sensitive to the thirst around us. He desires that we, who have drunk long at the springs of living water, gently encourage others to take a drink, so that they too will be forever quenched.